You can process 7 different types of transactions (New Order, Simple Charge, Auth Only, Refund, Voice Auth, Simple ACH, Reverse ACH) and activate gift cards. To access these types of transactions, click on the (+) next to 'Transactions' on the side menu bar. Simple Charge transactions are meant for one time credit card sales. From your Dashboard, click on ‘Transactions’ then click ‘Simple Charge’ on the drop down menu. To process a Simple Charge, you may swipe the customer’s credit card or manually enter the Charge Amount, Credit Card Number, and Expiration Date. These fields are required and must be entered to process the transaction. 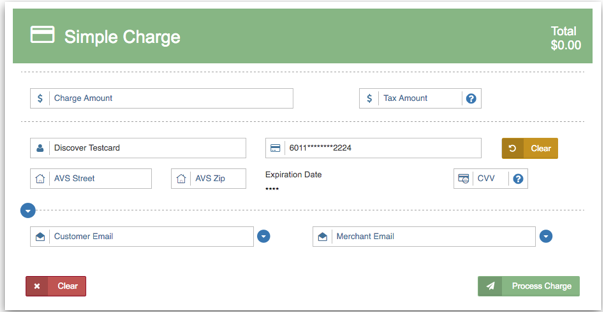 The Cardholder Name, Tax Amount, AVS Street, AVS Zip Code, and CVV fields are all optional. To swipe the customer’s credit card, click the 'Swipe' button. Once you click the 'Swipe' button, the ‘Please Swipe’ window will appear. Swipe the card when prompted. Once you have swiped the card, the customer’s encrypted credit card information will automatically be entered in the following fields: Cardholder Name, Card Number, and Expiration Date. To reveal additional fields (Company Name, Customer ID #, Invoice #, PO #, Order ID, and Description), click on the drop down arrow on the top left side of the 'Customer Email' Field. To email the receipt to your customer, enter their email in the 'Customer Email' field. To send a report of the transaction to your own email, enter your email in the 'Merchant Email' field. When Processing with an MP200L you can enable the capture signature option. Click here for more details. 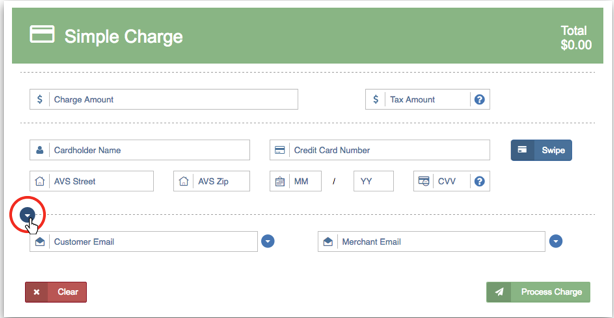 Once all desired fields have been entered, click 'Process Charge'. A pop-up window will appear with one of three responses: ‘Transaction Approved’, ‘Transaction Declined’, or ‘Error’.